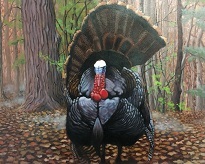 MADISON - Eighteen talented wildlife artists submitted a total of 24 pieces of artwork for the 2019 Wisconsin Wild Turkey, pheasant and waterfowl stamp design contest. Judging was held on July 20 at the Natural Resources Building in Madison. The judges for the 2019 Wisconsin Wildlife Stamp Art Contest were John Motoviloff from National Wild Turkey Federation, Burt Bushke from Wings Over Wisconsin, Bruce Urben from Wisconsin Waterfowl Association and Alex Weber from Pheasants Forever.